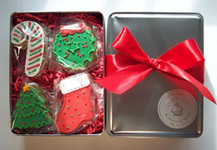 Our beautiful silver tins contain one dozen of our "little cookies", each approximately 2 inches and with the same delightful flavor! 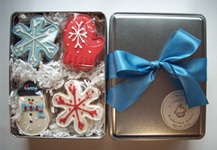 These delicious cookies are presented in our silver tin with signature seal, festive fill, and hand tied satin bow. Our silver tins make a lovely present.